Floating candles are absolutely lovely as decorations for summer parties, but they are generally more expensive than tea lights and less easy to find in the shops. 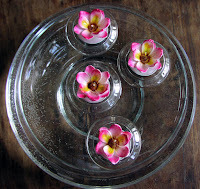 But there is a way to turn ordinary tea lights into floating candles. You can buy little glass tea light holders that are designed to float in water and keep the candles upright and dry. 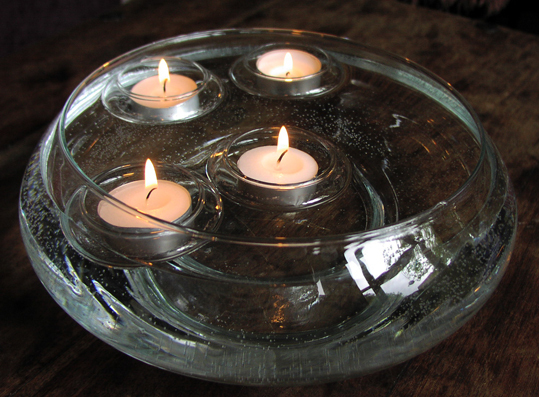 All you do is pop the tea light into the glass floater then carefully place it into a bowl of water. What’s more, once they are lit the tea lights stay alight for longer than usual because the water cools them down slightly. I was given a bowl with four floating glass tea light holders a little while ago and I decided to use it when I had friends around to celebrate my birthday. At the top of this post you can see a photo I took with the candles in it, burning prettily. Actually, what I originally wanted to use were a set of four lovely tea lights in the shape of flowers, but they were too heavy and sank into the water immediately. So, for my party, I used plain tea lights, which were fine. A couple of days later I decided to experiment. I dissolved a couple of tablespoons of salt into the water in the big glass bowl. Once I had done that, the water supported the glass floaters with the heavier and more decorative tea light candles just fine – as you can see in the photo to the right. It isn't magic really, of course, it is just science that I vaguely remembered from my school days. Adding salt to water makes it denser – or thicker – which means it is easier to float things in it. In science terms, it is the relative density between liquids and solid items that determines whether they float or not, rather than just the weight - but all you need to remember is that adding salt to water means it will support floating things better. The picture bottom left is one of a set of floating glass inserts for tea lights that I spotted on Amazon. It looks pretty much like the ones I've got.